In a boiling water drop the tomatoes and take them off after 3 seconds. Wash the tomatoes in running water. This procedure will help you take off the skin. Quarter each tomatoes and take off the seeds. In an electric mixer, start by throwing in the thyme and rosemary, then add the garlic. Put all the tomatoes, the olive oil ,salt and pepper and mix well. Sauté first the chicken flakes in olive oil with shallots for about 3 minutes. Then add the curry powder. Deglace the chicken with 1 tbsp of lemon juice, add a little bit of salt then turn of the fire. Spread over the pizza tomato sauce prepared over the pizza dough. 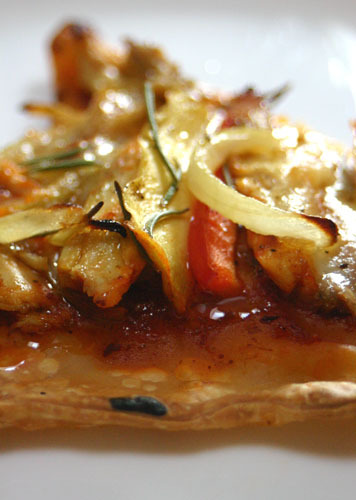 Arrange the chicken flakes alternately with mango slices, onion, red pepper and mozzarella cheese. Drizzle it with olive oil and bake for 20 minutes at 200° Celsius. I have just set up a site to sell philippines food in the UK. May I have permission to post your recipes there if I provide a link to you for each recipe I use? good day po! ma’am / sir! may i have a permission din po na iinclude ko po ito sa feasibility study ko po? focus po ako ngayon sa pinoy style na pizza. isasama ko po sa bibliography ang site na ito kung ok lang po sa inyo… thanks po!